Plastic seal is a kind of accessories made of plastic used to fix electric wire and cable. Plastic seal is composed of two parts. One end is a square plastic mouth with a hook elastic plastic lock and the other end is plastic seal itself with sawtooth and it can bend to penetrate the front plastic mouth and formloop, similar like belt on pants to tie up cable wires. 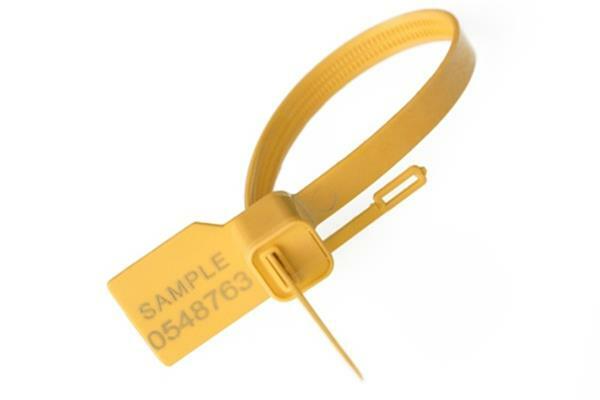 Security seal is one-time use seal, which is used to prevent stolen, change of goods during transportation. Because the special design of structure and material, serial number and mark is printed by laser printing. And any interventions to seals is easy to be found. It can strengthen the logistic control in an easy and rapid way. Due to one-time use feature, plastic seals can not be opened completely. Using lead sealing plier or scissor to cut it once goods arrive at destination. Once opened during transportation, it can not be recovered, there will be risk of losing goods.